A new book by Martin Walker - Cultural Dwarfs and Junk Journalism: Ben Goldacre, quackbusting and corporate science, takes on the UK variety of a particularly yucky kind of medical and industrial propagandists, the so-called quackbusters. The book can be downloaded freely from the Slingshot Publications site. Goldacre who it is claimed is a Junior doctor working in a London NHS hospital is actually a clinical researcher working at the centre of New Labour’s Orwellian spin operation that puts a sympathetic gloss on anything shown to create adverse reactions from MMR to Wi-Fi, while at the same time undermining cost-effective and long tried alternative therapies such as acupuncture and homoeopathy. Goldacre is involved with public health researchers well known for trying to prove that those who claim to be adversely affected by pollutants in our modern high-technology society, suffer from ‘false illness beliefs’. Their modus operandi is the same on both sides of the Atlantic: Protect the polluters and killers and ridicule anyone who would demand a cleanup or who could possibly provide more simple and more efficient solutions to the environmental and health problems that are a result of the polluters' actions. True to his incomparable style of investigative reporting, Martin Walker traces Ben Goldacre's career and connections and exposes him as the severely biased source of information the quackbusters say they want to combat. Be it chemical sensitivity, the MMR vaccine, mobile phone radiation, homeopathy or nutritional medicine, Goldacre has his fingers in the pie. Always defending the status quo and pointing to those who demand investigation and reforms as some sort of demented weirdos who should be banned from society. US citizens and others have had to deal for many years with Stephen Barrett MD, the now discredited, self-appointed quackbuster that has had the majority of leading protagonists of alternative medicine in his sights at one time or another. The UK has its own variant of Stephen Barrett. His name is Ben Goldacre and he has yet to be sidelined. Who better to take him on than award-winning journalist and author, Martin Walker, author of classics such as his 1993 exposée "Dirty medicine: Science, big business and the assault on natural health care." Martin has released, free of charge, for download from today at www.slingshotpublications.com, his assault on Ben Goldacre. Download all 280 pages of it today!! Also available from the same website is Martin Walker's last book, with foreword by ANH's Dr Robert Verkerk, "The Fate of a Good Man", which details the criminalisation of Jim Wright following his sale of vitamins after being set up by the UK's drug regulator and public broadcaster. Following is some more detail direct from the publisher about these two pieces of essential reading for all those concerned about some of the most salient challenges to natural health. Please get the word out as widely as you can - forward this email to anyone you know who might be interested. Thank you. Cultural Dwarfs and Junk Journalism is Martin Walker’s fourth book charting the development of the corporate science lobby that has grown rapidly since New Labour came to power in 1997. One of the most recent exponents of the Lobby is Dr Ben Goldacre who has regurgitated a bad ‘Science’ column in the Guardian newspaper since 2003. Like other quackbusters Goldacre claims to write factually based and scientifically accurate articles about health, medicine and science either supporting scientists and doctors or criticising individuals involved in alternative or nutritional health care. Goldacre’s writing, however, actually reflects the ideology of powerful industrial, technological and political vested interests. Cultural Dwarfs and Junk Journalism, investigates Goldacre’s role in industry lobby groups and puts another point of view in defense of some of the people whom he has attacked, belittled, satirized, castigated, vilified, maligned and opined against in his junk journalism. Cultural Dwarfs and Junk Journalism: Ben Goldacre, quackbusting and corporate science, is available from the Slingshot Publications web site as a free download, from mid-day on Wednesday January 2nd. To be effective as a campaigning document, it is important that this book is distributed far and wide as quickly as possible. Please forward this publication information together with the Slingshot Publications web site address. Another thing that will help with the book’s distribution is the writing of even very short reviews for different web sites, this helps get the book onto Google listings. This book is free and can be downloaded from the Slingshot Publications site: www.slingshotpublications.com. Please distribute it as widely as possible and if you think that the work is worth it, consider making a small donation. Also on the Slingshot site, is Martin Walker’s last book, The Fate of a Good Man. The book tells the story of Jim Wright, the investigation into him, his prosecution and trial by the Big Pharma regulatory agency, the MHRA. A good read at £5.00. This new essay from Martin J Walker details the way in which the science lobby has been involved in censoring the British media. 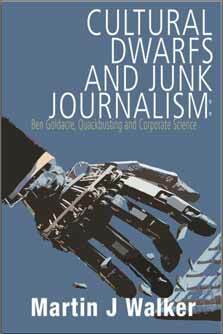 is further addition to Walker's free book, Cultural Dwarfs and Junk Journalism: Ben Goldacre, Quackbusters and Corporate Science. Ah! Another libelous "book" to join a website I see. I look forward to the impending court cases. (a point of view of an impartial computer scientist from Lithuania) After reading Goldacre's infamous book I also stumbled upon this one and read most of it. My impartial verdict: Goldacre 1 : Walker 0. The arguments Walker puts forward are too thin and too primitive when compared to the ones presented by Goldacre. Walker resigns to classical demagogy and manipulation, clearly targeting the less educated reader, which is a pity. If this is the best answer these people can give to the skeptics, then, I must say, skeptics win. And they win big. However, it's simply unfortunate that the the public opinion is clearly dominated by the superficial views put forward by Walker, even though they clearly fail to defend the pseudosciences and quackery. On the other hand, those who willingly support the brainwashing that homeopaths, astrologists and alike are conducting every day, should be ashamed of themselves. Skeptics? Definitely cultural dwarfs, unemployed social misfits culled from pubs (hence Skeptics in the Pub). Walker's research is spot on and not likely to be welcomed by those he outs.